This morning, in one of the sheds scattered around my work we found a dried out, desiccated rat body. It’s like rat jerky, it’s quite unpleasant. Discussing it with a workmate, she said “it’s weird that the… (and here she paused while she tried to remember the word)… rat people… you know, didn’t find it last time they were here.” She was trying to remember the business name of the guys who look after the rats on the property. But the term ‘rat people’ was so vivid, and suddenly I found myself trying to figure out a game where the players are rat people who invade the city at night. Around noon, I headed out for lunch. Standing at the corner, waiting for the lights to change, I glanced down. 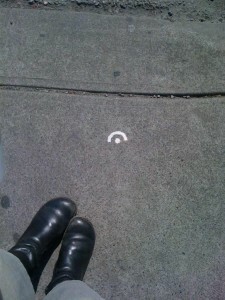 At my feet was a mysterious sign, painted on the concrete. I stared at it for a moment, trying to figure it out. Was it a clue? A puzzle? It looked like a waterhole from an Aboriginal dot painting. I wondered what else it might signify. Then the lights change and I was off again. As I crossed the road, I realised that I’m now always on the lookout for anything odd or out of place. Anything that might signify the start of a game, or the next step into one. Anything that I could use for a game. This is the thing about researching games and play. Everything around you is suddenly loaded with so much more meaning, so many more possibilities. It’s such an exciting world to live in! Play is make believe at the double. I look at something and I first see what it is, or at least what I believe it is, be it Simon Russell Beale, a banana, February 14th. But then I make believe what if that what is were something else: Hamlet, a revolver, the feast of St Valentine. What if. What is. I love how that is explained. Look, engage your imagination and look again. Discover the potential of what is right in front of you. Now that I’m researching games, I’ve also found I’m looking at people differently. Reading Jane McGonical’s Reality is Broken, she says that one reason people play games is to find and join communities of people like them. And when I’m walking down a street, I start seeing people for the first time. Not bodies around me, but individual people. I see that when people stop to talk to each other, they are doing so through shared connections. A lady stopping to talk to a woman with a baby shares a story of when her children were young. An old man waiting by the lights with me comments on the weather we’re both sharing. People are looking for an inroad to contact, and they grasp these tiny, shared experiences as the door. As a real world game designer (I’m still searching for a term I like) I think that games can offer that community sense, if only for a short time. When we were playing the scav hunt in Launceston, we suddenly were part of a community. Most participants were dressed in some sort of orange, and because we’d spent about half an hour before the game hanging out at the venue, we recognised each other on the street, we helped each other with clues and directions, while waiting around for things to happen we had common ground to talk about, cool stuff we’d just done or missed, plans for the immediate future, it gave us a link with these people and opened the gates for the flow of connection and conversation to start. I was reading Nina Simon’s The Participatory Museum the other day, and I’m telling you, if you are interested in learning about and/or designing participatory events for fun, for cultural institutions or anything in between, you need to own this book… Anyway, in it she was talking about an experience she had in a gallery once where there was a little stage and a couple of items and it had instructions to use the items to take tableau photos. She decided that she wanted to do it, so she handed her camera to a stranger named George and asked him to take a picture. Then he suggested one, and she suggested another. Pretty soon they were roping other people in and taking photos of them too. Over the page from the story, Nina has a photo of George and she says (and I’m paraphrasing here) “My partner in crime. We still talk over email, over a year later”. That’s a fairly incredible experience that can bond two strangers together like that. Participating in something out of the ordinary with someone forms a connection with that person which can last the duration of the event or for years afterwards. I’m interested in investigating how games open up the possibility of this powerful connection between people. Often, people are looking for a connection with others. I think that people are looking for shared connections, common denominators between themselves and other people. I think we all like to feel we belong. Subcultures are a strong, visual example of this. Richmond supporters have a uniform and a song, and during match times (and at other times) can easily spot other Richmond supporters, and there’s a kind of kinship with other football enthusiasts, whether they also go for Richmond or a different team. Coming across another footy fan, a person knows the social conventions and instantly has something in common with them, they are part of the community. They can gently rib the other supporter, commiserate a loss or gloat over a win. A goth can move cities, states or even countries and find people they know are going to like the same kind of music and think the same kinds of things. Having something in common with someone is like a fast track to knowing them. You don’t have to go through all the awkward getting-to-know-them stuff, you can just hone in on the shared hobby/taste/subculture ect. And start from there. But it doesn’t have to be something big, or something that people identify with, to share a momentary connection with people. Both reaching for the same spoon at a café, both standing in line waiting for a bus, bumping into someone can all be a moment for a shared connection. And I’ve been thinking about this in terms of games. Games give people that common denominator. Walk into a room of people who have never met each other before and have gathered for a game of Lemon Jousting. At the start they are milling around, just talking to their friends. But by the end, they’re happily chatting to everyone, cheering on the winners and commiserating with the losers. There’s trash talk and helpful suggestions being flung around the room. These people are the same people that entered the room an hour ago, but now they’ve shared an experience that’s out of the ordinary, and that is a powerful connection. Researching and designing also gives you another filter to see the world. Not just what game could I play with that stick, is that mark on the building part of a game I’m missing, but it encourages you to look differently at the people around you. My partner in crime, Rob, emailed me about a TedX video on YouTube by the aforementioned Tassos Stevens in which the sound cuts in an out quite severely at the start of the clip. I think that’s really interesting. We’ve been a part of a number of Tassos’s games, and we’re both members of Coney, so we know the way Tassos works, and that anything at any moment could suddenly turn into a game, or indeed suddenly you’ll have a dawning moment that what you’ve been doing for half an hour is actually a game, but you’ve only just realised it. It’s playful and sweet and always exciting. But what happens then with that is that people that know what you do and who you are now always on the lookout for the purposes behind what you are doing, even when you’re not, as Rob says, up to anything at all. But that’s a danger and a reputation that I’m happy to take on. I think there’s always room for more tricksters.